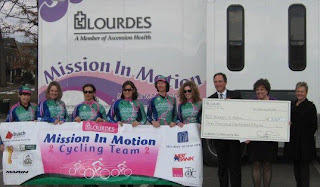 The Mission in Motion Cycling Team presented Lourdes Hospital with the team’s largest annual donation. 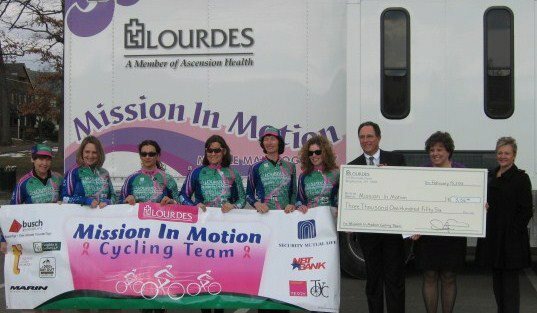 Feb. 18, 2013 - Binghamton, NY - The Mission in Motion Cycling Team presented Lourdes Hospital with the team’s largest annual donation. Members of the team presented a check for $3,146 on Friday, February 15th at Recreation Park in Binghamton. According to team director, Marsha Kapinus, the team has donated over $13,300 to date. 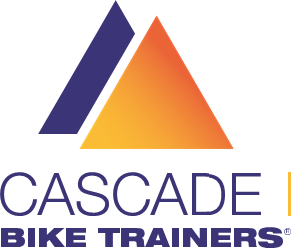 The money raised comes from a combination of race proceeds (including the Waverly Glen Challenge and the Crossfire Cyclocross race), race winnings, bake sales and other fundraising efforts. The donation goes specifically towards Lourdes Hospital’s Mission in Motion Mobile Mammography Van. 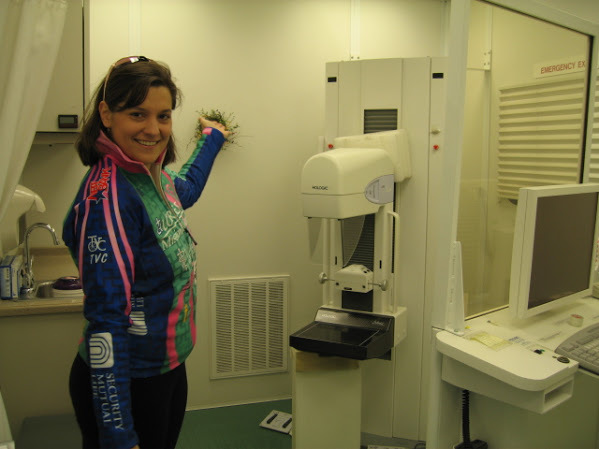 The Lourdes Mission in Motion Mobile Mammography Van, a breast care unit, sets the Lourdes mission of comprehensive health care in motion by reaching out to women in the community. The unit provides breast exams, digital mammograms and pap smears, all in a location that is convenient for you. Tiffany in the mobile MIM van! Through event promotions and community development, outreach programs, and racing activities (such as providing volunteers for the Chris Thater Memorial Race), Mission in Motion Cycling Team plays a significant role in the region and its surrounding areas by promoting health awareness, race and bike safety, and physical fitness.